We’ve landed!!! After 31 hours of travel, we have finally reached our hotel in Cape Town, South Africa, the first leg of our adventure! 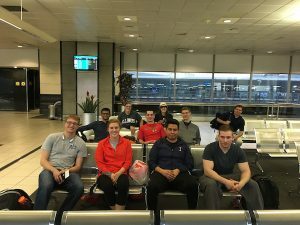 This morning a group of 11 eager, sleepy-eyed University of Illinois Global Leaders in Construction Management students boarded a quick 2-hour flight in Chicago headed for Washington, D.C.’s Dulles International Airport. Upon landing in Dulles, the group had a 5-hour layover before the flight took off for South Africa. After the huge decision of where to eat lunch in the terminal was made, the group killed time by playing some cards and walking around the terminal trying to determine what state or country the flags hanging from the rafters originated. Around 5:40 pm (EST) we finally lifted off from Dulles in our “roomy” Airbus 340-600 series. On the first leg of the 16-hour flight, we were served dinner and breakfast. The trip to Johannesburg is completed in 2 parts. 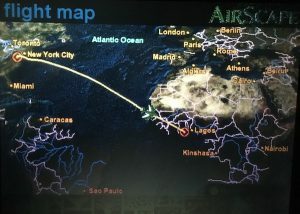 After about 9 hours of flying over the Atlantic Ocean, the plane touched down in Ghana, where about half of the passengers disembarked. During the 1-hour pit stop in Ghana, a new crew came on and cleaned the cabin, re-fueled the plane, and added new supplies for the next meal. When the crew was finished, new passengers boarded, and a mysterious citrus disinfectant spray was sprayed in the plane. Shortly after, the plane was back in the air, enroute to Johannesburg. During the 5 hour and 50 minute flight to Johannesburg, the passengers were served lunch. 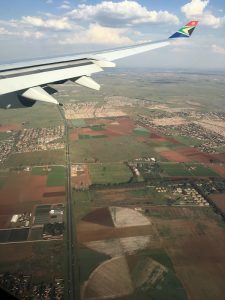 Finally the plane touched down in Johannesburg, it felt awesome to exit the plane and be able to finally stretch our legs! 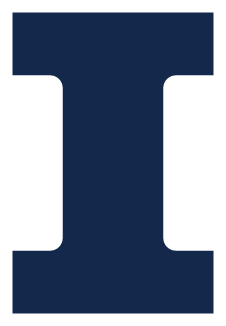 We did not have much time though, since we had to get through customs, retrieve our checked luggage, re-drop off the checked luggage for the domestic flight, and make it back through security in under 2 hours! Luckily everyone’s luggage made it from Dulles and the lines moved quickly so we caught the final flight, a domestic trip to Cape Town. The final domestic trip was 2 hours, but it felt about the same as the 16-hour flight. By this point all of our internal-clocks were quite confused because it’s nighttime again and we feel like all we have done is travel, although we are only 8 hours ahead of Chicago. 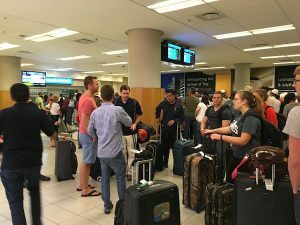 The domestic flight touched down in a warm Cape Town and the weary travelers exited onto the tarmac feeling rejuvenated by the refreshing breeze. We found our way to the luggage carousel and luck would be on our side again, we all retrieved our checked luggage! 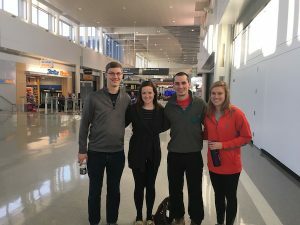 With luggage in hand, we exited the airport terminal to meet our Volunteer Adventure Corp (VAC) guides, who will be with us throughout our time in South Africa and had a huge part in setting up our itinerary.